It is only in recent decades that the value of wetlands has been properly understood. Wetlands provide a habitat for a diverse range of plants and animals. More importantly they play a valuable role in filtering the water that flows through them. In the case of the Westlake Wetlands this means cleaner water for the main body of the Zandvlei Estuary. Westlake Wetlands are an important part of Zandvlei as they receive their water (prior to the water reaching Zandvlei) from two rivers that been seriously impacted by city decisions and invasive water plants over the years. Since 2002, a group of local volunteers regularly review, research and maintain the water body in this section of the Westlake Wetlands in partnership with the local authorities. They clear invasive plants and repair and maintain the booms / traps across the open water bodies at the confluence of the Keysers and Westlake Rivers before they reach the main Zandvlei water body. 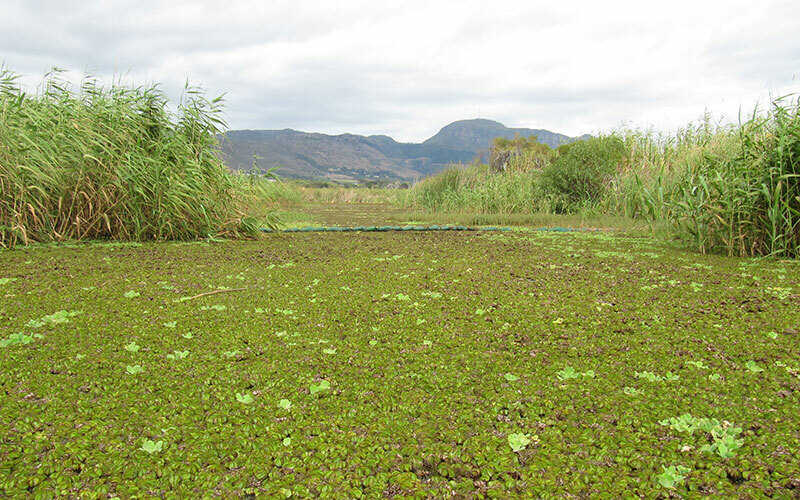 Currently the Westlake Wetlands Project, in partnership with Peninsula Beverages has led the way in clearing the water hyacinth from these wetlands, with spin-off benefits for the rest of the city’s rivers and water systems. PenBev (a bottling company that distributes Coca-Cola products across the Western Cape) has kindly sponsored this project since 2009. 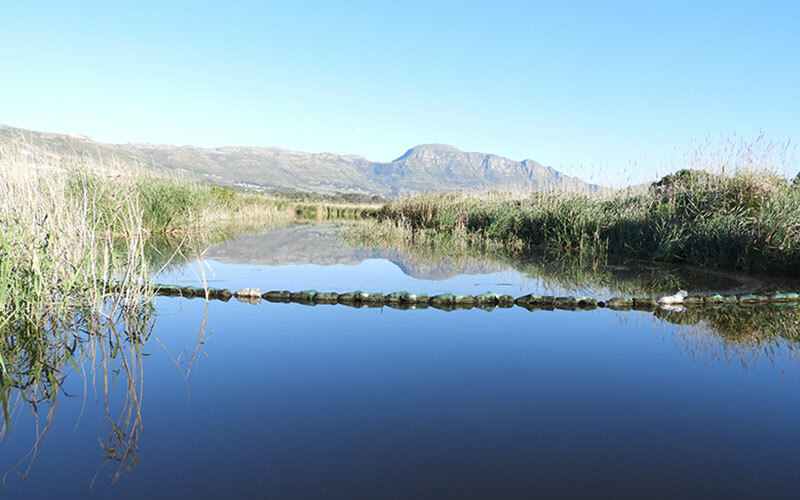 John Fowkes, Project Coordinator for the Zandvlei Trust’s Westlake Wetlands Project explains that fish cannot survive in water that has a ‘carpet’ of weeds covering it because it reduces sunlight and the oxygen in the water. “When the fish go, the birds that live on the fish go as well. It has a dramatic impact on the ecosystem – that’s why we must keep the water open and flowing,” he says. In addition to manual clearing of the invasive hyacinth, the introduction of the floating boom mechanism holds the weeds back from spreading into open water. These are made of 2 litre plastic cold drink bottles placed in a netting sleeve. The floating booms act as a security barrier against potential future infestation and help contain any areas still harbouring hyacinth. Over time the bottles deteriorate, mainly due to temperature changes causing expansion and contraction. These bottles are then replaced with new stock and the old bottles are bagged and sent for recycling. The effect of this work can be seen in an increase in fish activity. This in turn has led to an increasing number of kingfishers, herons and cormorants that, together with a number of people, come to fish in the cleared waters. The endangered Leopard Toad population also appears to have spread into some of the cleared areas. So through innovative thinking, community action and collaboration with a range of partners, litter has been turned into booms that help combat an environmental threat. One could say that this initiative is booming success!